Azamara Club Cruises believes that destinations are more than just geography, but rather the sights, sounds and tastes of a region. With its 2014 AzAmazing Evenings (http://tinyurl.com/mpqh675) program on more than 60 voyages, the cruise line is providing guests the opportunity to further their vacation by enjoying an exclusive, authentic and cultural evening event. Whether enjoying a private, three-tenors performance, set in a 19th century opera house in Livorno, Italy, or joining in a local Burmese festival, guests will find themselves immersed and living the culture rather than just seeing it during a brief visit. Building upon its carefully crafted itineraries that coincide with major world events, the cruise line simultaneously crafts AzAmazing Evening events that reflect those moments. For example, during Azamara Journey’s “Past to Present: Normandy 70 Years Later,” (http://tinyurl.com/oh7x2bf) guests will be treated to an AzAmazing Evenings event of a D-Day Liberation Party at Cherbourg – exactly 70 years to the day that the landings took place. Later in the year, guests sailing Azamara Journey’s “A Southern Hemisphere Holiday,” (http://tinyurl.com/dxlsze9) will enjoy a Plataforma 1, one of Rio de Janeiro’s leading samba show houses to see samba’s 500-year history come to life in an eye-popping show, complete with caipirinhas, Brazil’s national cocktail. These signature events are complimentary and held once a voyage, typically ashore during the evening. On select voyages, the sights and sounds of a region are transferred onboard, where the ship serves as a backdrop for an evening of cultural immersion. For example when calling at Safaga, Egypt, guests will experience an Egyptian Moulid. This festival is part carnival and part mystical celebration, and includes ritual dancing, chanting, whirling dervishes and circus performers. AzAmazing Evening events cover a breadth of activities including night access to some of the world’s best-known sites such as Ephesus; St. Michael’s Cave at the Rock of Gibraltar, or the Chateau Giscours in Bordeaux. Travelers can narrow down their voyage by destinations or choose a voyage with an event that will add to their experiential portfolio. For a full list of Azamara Club Cruises’ 2014 AzAmazing Evening events visit, http://www.azamaraclubcruises.com/AzAmazingEvenings. Azamara Club Cruises offers distinct destination-immersive experiences for up-market travelers. The cruise line features voyages with longer stays and more overnights at ports to provide guests the opportunity to experience night touring at some of the most compelling destinations of Europe, Asia, South America, West Indies, as well as Central and North America. On board the intimate Azamara Journey and Azamara Quest, guests receive exceptional and personal service and the cruise line’s authentic, exclusive and bespoke AzAmazing Evenings events that showcase the unexpected colors and flavors of a destination. Guests also enjoy fine cuisine and boutique wines from around the world, as well as more inclusive amenities, such as included gratuities; complimentary bottled water, sodas, specialty coffee, and teas, as well as complimentary boutique wines, international beers and select standard spirits in the ships’ bars, lounges and restaurants when open; complimentary self-service laundry; English Butler service for suite guests; and shuttle transportation to city centers in ports, where available. 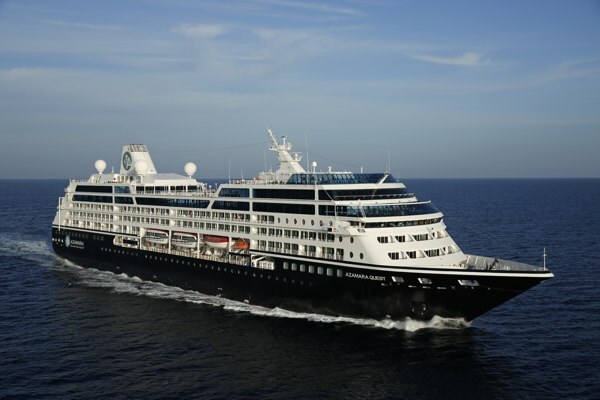 For more information, travelers can call their travel professional, dial 1-877-999-9553, or visit www.AzamaraClubCruises.com. Connect with Azamara Club Cruises on Facebook at http://www.facebook.com/AzamaraClubCruises, on Twitter @AzamaraVoyages or follow President and CEO @LarryPimentel.